The June 2016 issue of StewardCAST focuses on celebrating stewardship, both as individual stewards and as congregations. In the May 2016 issue of StewardCAST, LCMS Stewardship Ministry highlights how faithful whole-life stewardship goes well beyond envelopes and offering plates, budgets and balance sheets. Stewardship is not just one of the things we do in our life with the Lord; stewardship is our life. In the April 2016 issue of StewardCAST, LCMS Stewardship Ministry looks at how people today are living longer and the unique challenges this creates for congregational leaders and laypeople. In the March 2016 issue of StewardCAST, LCMS Stewardship Ministry discusses stewardship across the various generations within our society today. For the first time in human history, five generations are living and active at the same time: Traditionalists, Baby Boomers, Generation X, Millennials and Generation Z. 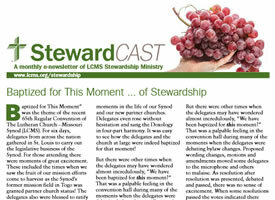 In the February 2016 issue of StewardCAST, LCMS Stewardship Ministry discusses how the Lord has given us only one day to use as steward: today. The faithful Christian steward is called to become a faithful steward of today. 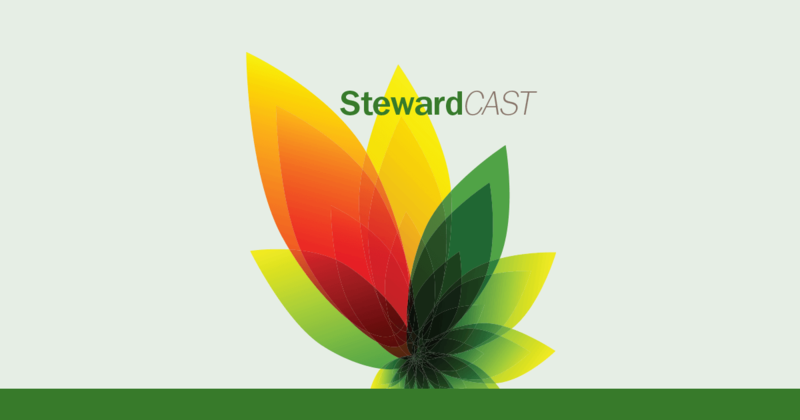 In the January 2016 issue of StewardCAST, LCMS Stewardship Ministry highlights how important it is for individuals and congregations to be good stewards of life. In the November 2015 issue of StewardCAST, LCMS Stewardship Ministry reminds readers that, in the realm of Christian stewardship, both the pastor and the people are intricately linked in the teaching, learning and practice of it. In the October 2015 issue of StewardCAST, LCMS Stewardship Ministry reminds readers that we, as God’s children, are surrounded by lessons in stewardship each day. In the September 2015 issue of StewardCAST, LCMS Stewardship Ministry discusses the oft-forgotten concept of the stewardship of relationships. In the August issue of StewardCAST, LCMS Stewardship Ministry shares Scriptural insight into the “dog days” of stewardship. Relief from these times is the Gospel and the realization of the blessings and bounty the heavenly Father provides us through Jesus. In this issue from LCMS Stewardship Ministry, the importance of the “why” of stewardship being included in the teaching and preaching of stewardship is discussed. The “how” of stewardship is typically highlighted. However, reminding people of who they are as stewards and the implications of God’s creation and recreation and the Holy Spirit’s work in them to be faithful stewards are essentials elements in teaching stewardship. In this issue from LCMS Stewardship Ministry, the “why” and “how” of an LCMS congregation’s support of its district and of Synod are discussed. The decision of the amount of a congregation’s Mission Partnership Gift to District is something that every congregation faces in their annual budget process. Prayer and open communication are encouraged by all those involved. What better way can there be to teach members about prayerful individual stewardship than to model it at the congregational level? In this issue from LCMS Stewardship Ministry, the questions of to WHOM the steward should give and WHERE should a steward’s gift be given are addressed. When affirming one’s desire to become a member of a congregation, a person promises to support that congregation with his/her prayers and the gifts God has given to him/her. These promises need to be considered when answering these two questions. In this issue from LCMS’ Stewardship Ministry, the importance of seeing stewardship within congregations as not only a financial matter, but also as pastoral care for the souls of members is discussed. When stewardship is viewed in this holistic manner, great things can happen with the Church. In this issue from LCMS’ Stewardship Ministry, the role of storytelling in the area of stewardship is discussed. Using this very powerful communication tool must be done with caution because the story itself can be idolized. This does not mean, however, that story should be avoided. It can actually be a rich blessing in a congregation’s stewardship life. To achieve this, the pastor must seek out and strategically use stories of faithful stewardship to help alter the congregation’s stewardship culture.